Six six-coupled locomotives, built by the Hunslet Engine Co., were supplied to the consortium of John Mowlem & Son Ltd. and Edmund Nuttal, Son & Co. (London) Ltd for use on the construction of the King George V dock at Southampton. They were delivered in three batches of two during July 1931, Cunarder arriving on the 27th July 1931. On the completion of this contract, in 1933, the engines were transferred to Dover for work on the Train Ferry Dock. In 1935 Edmund Nuttal brought them from the joint company and they were moved to Wallasey for use on the Sea Wall and Promenade contract until 1938. During the wars years they were employed on the construction of Ordnance Factories in Wales and Herefordshire and on open-cast coal workings in the North of England. Two engines were sold in 1945 while the remainder went to Ipswich for work on the construction of the Power Station. In 1949, they were returned to the firms plant depot near Slough. Subsequently Cunarder worked on hire to a variety of firms until sold to ACM Harbury in 1957. It was purchased from there by a group of QRS members, arriving at Quainton on 24th April 1969. The engine had been retubed twice and had a new firebox fitted whilst in commercial use, and a further set of tubes installed at Quainton. Cunarder was steamed on many occasions whilst at Quainton sporting a light blue livery. Cunarder left Quainton on 7th March 1976 and spent a number of years at APCM, Houghton Regis, Dunstable. 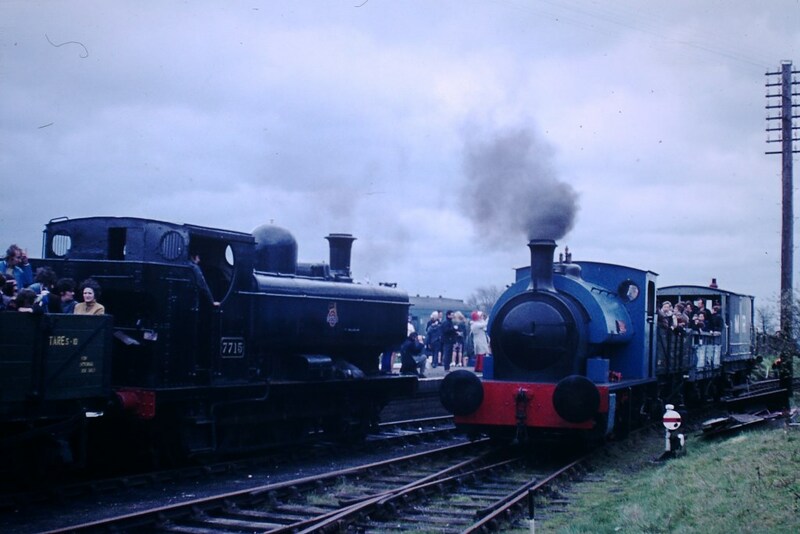 Cunarder then moved to Swanage, where it operated as both a saddle tank and a side tank from 1981 to 1995. The loco having been converted during this time; the saddle tank was retained for reuse. Cunarder then moved to the Lavender Line from 1995 to 1996, when she was withdrawn due to firebox problems. It was then stored for several years at Bill Parker's Flour Mill restoration base in the Forest of Dean from 1996 to 2004. She was then moved again to South Coast Steam Co Ltd, Portland, Dorset, departing there in 2012. Cunarder was moved to private site in Dorset, where restoration to the saddle tank form is underway. Tractive Effort :- 11, 760 lb Boiler Pressure :- 160 psi Cylinder Dimensions :- 15" x 22"
Weight :- 30t 6c Driving Wheel Dia. :- 3' 9"